The Southland Society of Model Engineers is having our 30th annual ‘Great Little Train Show’ this coming Labour Weekend at our grounds in Surrey Park, Invercargill. Not only is this our club’s major fund-raiser, helping keep our club financial for the following year but also allows us to connect with many, both old and young, in our community who enjoy the same hobbies or gives young people the chance to see that ‘old school’ toys can be still fun. 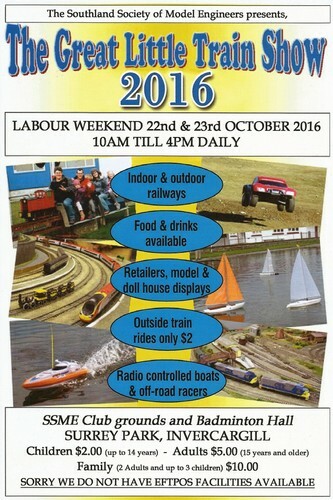 Model Trains & Displays, Radio Controlled Boats on the pond to view, Rc buggies on the dirt track displays, Ride-on Trains.